These peanut butter pretzel bites are like a cross between a peanut butter ball and a chocolate covered pretzel. Doesn’t that sound amazing? With a combination of peanut butter, chocolate, and pretzels, how can you go wrong? I enjoyed making these treats not only because they tasted great, but also because they were incredibly simple and very cute. You can use any type of pretzels you want – traditional pretzel shapes would work great, as would the little square ones. I happened to find Christmas shaped pretzels at Meijer, which made these little treats extra cute! *Note: you can find the holiday shaped pretzels on Amazon! Line a baking sheet with wax paper and set aside. In the bowl of a stand mixer fitted with the paddle attachment, beat peanut butter and butter until combined. Scrape down bowl, add sugars and beat until combined. You should be able to roll the mixture into balls without sticking to your hands. If needed, add more powdered sugar until you reach a consistency that is easy to roll. Roll the mixture into small balls, about 1 teaspoon of mixture for each ball, and place on prepared baking sheet. Sandwich the balls between two pretzels and place in the freezer for 30 minutes. Melt the chocolate in a metal bowl over a pan of lightly simmering water. Stir occasionally until smooth, and remove from heat. 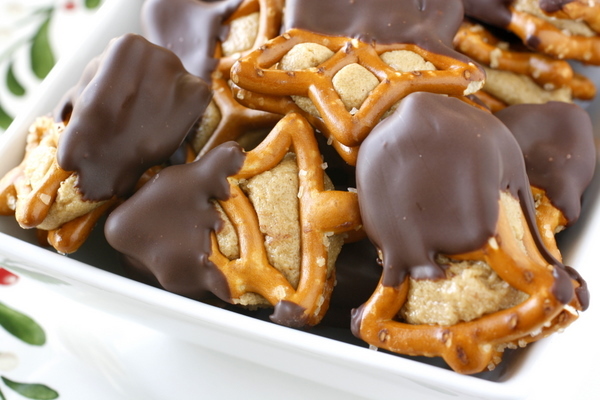 Dip each pretzel bite halfway into the melted chocolate and place on the prepared baking sheet. Chill in refrigerator until chocolate is set. 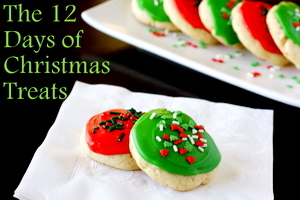 For all 12 Days of Christmas Treats click here! Just made pretzels with a dark choc. 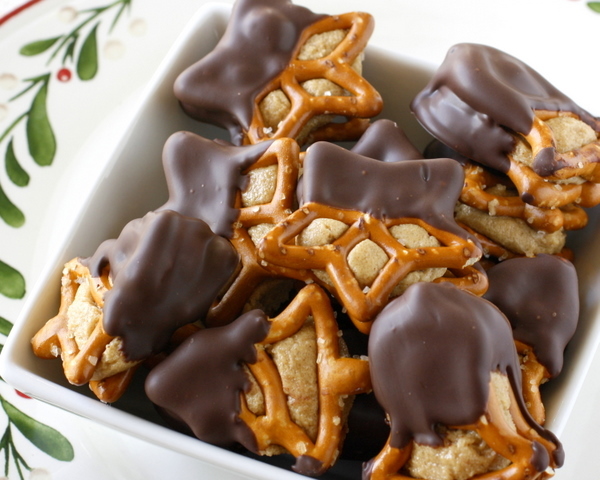 kiss inside for church…would love to use Christmas shaped pretzels, where did you find them? I just stumbled across them at Meijer. They were Meijer brand, but I’m guessing other brands make them. 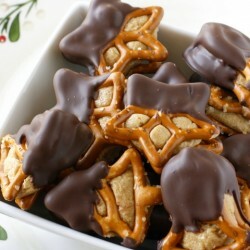 If you can’t find them, I bet they’d still be cute with the regular pretzel shape, or with the square ones! I finally found something good to make for our Hot Chocolate Party this weekend. Thanks Megan! They look yummy! Those sound super addicting. Great salty sweet combo. WOW! Christmas came really early for me! It is now indeed…as I have stumbled upon your post. I am a pretzel fan and definitely an addict of PB. I will have to make this now! Yum!Yum! Love the halfway design. Looks cool and unique! Great post, Megan! these look adorable and delish. My kids would love me to make these for them. I must try these. They look absolutely delightful. I must say it’s a very creative idea! Thanks for sharing. Those look dangerously good! Peanut butter, chocolate, pretzels… YUM. These look fantastic! My husband recently told me that he’s not a huge fan of the peanut butter – chocolate combination. I think he’s insane!! I’m definitely going to make these very soon. Thanks! Awesome simple and delicious looking – great quick treat, thanks! These look great! Question….have you made these without the butter? I’m wondering if it’s necessary to even have the butter. I don’t think I needed to add much extra powdered sugar, but maybe it depends on how soft your butter was or what type of peanut butter you used. 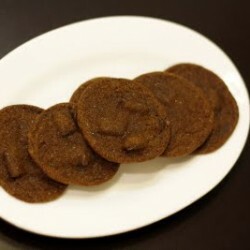 The second time I made them I actually skipped the brown sugar and used all powdered sugar – I just kept adding it until it was the right consistency. I think I liked that way better. 🙂 Anyway, glad you liked these! I would say it makes about 45 sandwiches, depending on the size of the pretzels you use, how much filling you use per pretezel, etc. I don’t have a stand mixer. What’s the best method to mixing the pb, butter and sugars? Looking forward to making these!! Thanks! Where did you find the Christmas pretzels? We love these treats and the pretzels would make them even more fun! Pingback: Two Cent Tuesday… Back Again! « All I Eat Food! made these for a wrap party and they were a huge hit! the bonus? they taste equally (if not better) delicious when frozen! can’t wait to make again! I’m so glad you liked them! And I agree – way too good frozen! 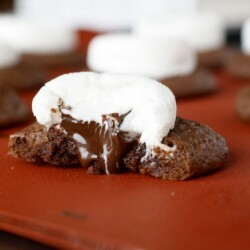 I am about to make these. Is there a good way to store them? Do they need to be in the fridge or freezer? Do they last for a few days or more? These look delicious! I love the combo. These are amazing! I made these for our holiday party 2 weeks ago and I kid you not, they were the first things to go. I doubled this recipe and they were gone in about 15 minutes! Promise! Soooo good and simple to make! Thanks for the recipe! Yay, I’m so glad these were such a hit!! We also made these for teacher/co-worker goodie boxes and even my husband (who does not eat sweets) liked the ones that were not dipped in chocolate 🙂 I only wish I could have found the cute shaped pretzels for Christmas…I just saw the post above that mentioned Sam’s Club, I will check there first next year 🙂 Thanks for sharing! I know this is an old posting, so I hope someone can still answer. I noticed several of you saying you froze these. How were they as far as texture, etc. after they were thawed? 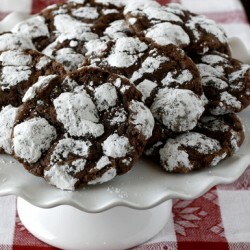 I ask because I’d love to make them soon and freeze them for the holidays. I try to do a little baking and freezing each month from now until the holidays. Some things get soft or squishy after thawing, so I thought I’d ask first. Thanks! You can get theses pretzels at Sam’s during the Christmas holiday’s. 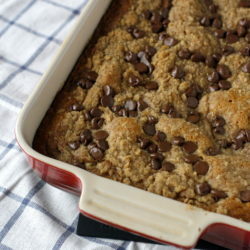 I see this is an older post, but I just found this on Pinterest, and was thinking about switching out the peanut butter mixture in this recipe for Reese’s peanut butter (for a friend who is crazy about Reese’s peanut butter) but would that still work as far as consistency goes? ????? ?Is it necessary to add the sugars?????? You could try it without the sugar, but then it would basically be pretzels and peanut butter. Maybe try reducing the sugar instead? Can’t wait to try these. They look amazing. I love the font you’ve used for your headings. Which one is it? Thanks! Unfortunately I’m not sure on the font since I had a designer do all that stuff. Where did you find the Christmas tree shaped pretzels. They are wonderful. I live in New Haven CT. Any thoughts? I found the holiday shaped pretzels at ALDI. I hope everyone has one near them. Making mine now as a gift for some bank tellers I use to work with. I hope they like them. So pretty! Have you ever tried shipping these. I was going to but as I’m making them they seem like they may get a little sticky if they sit out to long. Made this dipping in white chocolate—OMG, you have to try that, also….sooo delish!!! Hi! these are so incredibly good and sooooo easy! The recipe above makes about 80 pieces and they are a huge hit! Thank you, Megan. These are so adorable (which people commented on), but that only set them up for the wonderful taste! I love looking at the faces when they ooh and aah! Have a great holiday! Hi! I found your recipe copied word for word in Daydream Kitchen, along with your photograph. It’s quite deceptive because the site says that _they_ uploaded the recipe, and under one photo there is a credit to your site. I’m curious if you actually gave them permission or if they are ripping you off. See at the top where it says it’s ‘by daydream kitchen’? Yeah. I was raising an eyebrow at that! It’s pinned on Pinterest, but it’s pinned as THEIR link, not yours! Pingback: Chocolate and Peanut Butter - Chocolate Chocolate and More! we made these last night… yum. Kids had a fun time rolling pb dough into balls… we even added sprinkles… so good! thanks for posting! because this moment i am reading this fantastic educational post here at my house. A lawn care and snow removal business is fairly easy to start. of businesses from food, retail, internet, beauty salons to distribution services. Many master franchises can be started out of a home office. you want it, just ask for extra cheese on any menu item. wisely find high profitable keywords, the “buyer kind” of keywords. My step-son made these for his son’s teacher. Fortunately, he made enough for me and my daughter to enjoy. They were amazing! We couldn’t get enough of them. I am planning on making these for my holiday presents for my neighborhood (if I can keep my daughter from eating all of them). Thanks so much for posting! I know this is an old post, but hopefully someone will reply…I’ve made these a bunch of times, and they are delicious. My only negative comment is that once they come to room temperature after storing them in the freezer, the PB center gets really mushy and unformed (if that’s a word!) It makes it very difficult to give these as gifts. Am I doing something wrong? They are wonderful. thanks so much! These look great I want to give as gift – do they require refrigeration once set? No, they should be good for short-term storage at room temperature! The recipe above makes about 80 pieces and they are a huge hit!